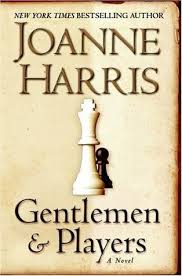 Gentlemen & Players is an intricate mystery by Joanne Harris, an author probably best known for her best-selling novel, Chocolat. Before she made it big in the publishing world, Harris was a school teacher which probably came in handy while writing this story of a public (in Britain this is the equivalent of our private, thus you pay a tuition) school in England. For readers unfamiliar with the British school system, the story will likely seem extra exotic. I grew up reading Enid Blyton books and dreaming about going to boarding school in the UK, so I was all over the notion of the tuck shop (the place to buy sweets) and copious gallons of tea consumed by the teachers. The novel gets its name from cricket, another very British enterprise. A first class cricket match pitting a team of amateurs (the Gentlemen) against the professionals (the Players) is a throw back to the class system in the 19th and 20th centuries. The Players were the working class guys and the Gentlemen from the middle and upper classes. Harris’s novel has two narratives taking place over two different time periods. In one we follow Roy Straitley, a Classics teacher at St. Oswald’s Grammar School. He’s been in the business for over three decades and is soon to be turning 65. (I was relieved to see that Mr. Straitley still enjoys teaching since I’ll be at least that old before I will be able to afford to retire.) Straitley has dedicated his adult life to teaching at the school and prides himself on his ability to control his class and remember all the boys he’s taught over the years. In the other narrative, an unnamed narrator watches St Oswald’s from the gatehouse where they live with their father, the school’s porter (aka custodian). I understood at once that they were a different race to myself; gilded not only by sunlight and their proximity to that lovely building but by something less tangible; a slick of assurance; a mysterious shine. Later, of course, I saw it as it really was. The genteel decay behind the graceful lines. The rot. Fifteen years later, the narrator shows up at St. Oswald’s with forged credentials and begins to teach and all hell breaks loose. At first the pranks are minor, missing registers and pens, but before long things get serious and lives are ruined and lost. Gentlemen & Players was an easy read (despite all the wacky names I had to keep straight). Does it have something to say about the haves and the have-nots? Not really, since the second narrator just seems jealous and, quite frankly, crazy. Will I be thinking about these characters in a week? Not likely. Was I shocked by the surprise? No, I figured it out. Careful readers will. Still, I passed a pleasant few hours reading the book and if you like suspense thrillers, this is well-written (except for the over-the-top use of semi-colons!) and fun – if you don’t think too long on all the novel’s implausibilities. This entry was posted in Book Chat and tagged 2014, book club pick, Book Review, page turner, psychological suspense by Christie. Bookmark the permalink.